And He, like the sun, will by the aid of thy purified eye show thee in Himself the image of the invisible, and in the blessed spectacle of the image thou shalt behold the unspeakable beauty of the archetype. Through His aid hearts are lifted up, the weak are held by the hand, and they who are advancing are brought to perfection. Shining upon those that are cleansed from every spot, He makes them spiritual by fellowship with Himself. Just as when a sunbeam falls on bright and transparent bodies, they themselves become brilliant too, and shed forth a fresh brightness from themselves, so souls wherein the Spirit dwells, illuminated by the Spirit, themselves become spiritual, and send forth their grace to others. Hence comes foreknowledge of the future, understanding of mysteries, apprehension of what is hidden, distribution of good gifts, the heavenly citizenship, a place in the chorus of angels, joy without end, abiding in God, the being made like to God, and, highest of all, the being made God [that is, sharers in the divine nature]. 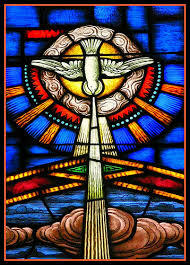 Such, then, to instance a few out of many, are the conceptions concerning the Holy Spirit, which we have been taught to hold concerning His greatness, His dignity, and His operations, by the oracles of the Spirit themselves.